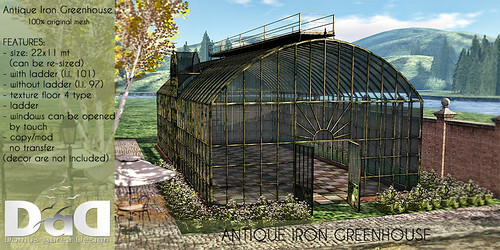 I am very proud to present my latest creation “Antique Iron Greenhouse" 100% original mesh. There are two versions included in your purchase: with or without a ladder to climb on the roof. This Antique Iron Greenhouse is perfect also as shop, ballroom, restaurant or as a public recreational area.